The latest installment in the groundbreaking series battles for supremacy during a fierce summer of sequels. This image released by Universal Pictures shows a scene from the upcoming "Jurassic World: Fallen Kingdom," in theaters on June 22. Universal Pictures has announced plans for a third installment in the rebooted dinosaur franchise. “Jurassic World 3” will land in June 2021. "Jurassic Park" stomped its way into theaters and to the top of the summer box office pile 25 years ago this month, kicking off a new era in moviemaking. Steven Spielberg's fresh blast from the past roared as the biggest moneymaker of 1993, a year where nary a sequel landed among the Top 10 flicks. In 2015, “Jurassic World” placed second in the domestic box office race, one of seven new entries from familiar series to pack the Top 10. The year's No. 1 hit: "Star Wars: Episode VII – The Force Awakens." “Jurassic World: Fallen Kingdom” debuts Friday during a fierce summer of series and sequels – a battle playing out on a landscape the dinosaur film franchise helped clear a quarter century ago. As we learned in "Jurassic Park," the past is always closer than it appears. That mirror into modern filmmaking reflects the stakes Spielberg raised when he used then-groundbreaking CGI effects to bring Michael Crichton’s novel to boisterous, pulse-pounding life. It marked a sea change for a director whose 1974 breakout effort, "Jaws," featured precious few appearances by the decidedly low-tech, but forever frightening title character. The superhero all-star epic is among the films battling for the year’s No. 1 spot, along with “Black Panther,” another Marvel Comics Universe blockbuster. “Fallen Kingdom” also faces strong competition from “Incredibles 2,” just off a record opening for an animated film – but not so much from “Solo: A Star Wars Story,” which is somehow a financial disappointment as it approaches $200 million domestically. “Incredibles” and “Solo” illustrate not only the risky business of big-budget filmmaking, but also the double-edged lightsaber of nostalgia. “Fallen Kingdom” seeks to meld the old and new with the return of Jeff Goldblum’s Dr. Ian Malcolm for his first appearance since 1997’s “The Lost World: Jurassic Park,” the last installment Spielberg directed. Meanwhile, Spielberg serves as an executive producer of "Fallen Kingdom" as his latest directorial effort, “Ready Player One,” hangs in the year’s Top 10 – at least for now. It’s worth noting that Spielberg reaped Best Director and Best Picture Oscars for another 1993 Top 10 box office hit: “Schindler’s List,” perhaps his most powerful film. 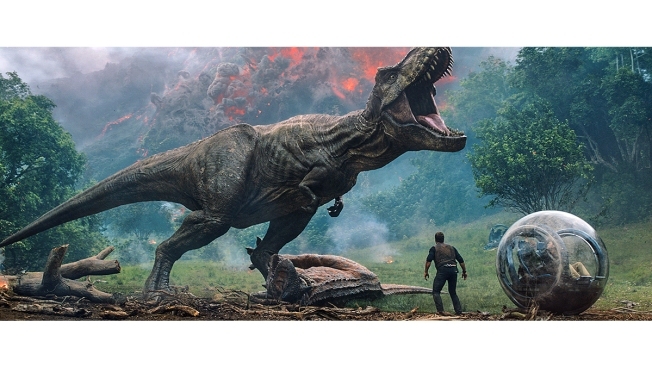 Academy Awards, save perhaps for technical category honors, seem unlikely for “Fallen Kingdom.” Still, the DNA strain Spielberg spawned with “Jurassic Park” courses through “Fallen Kingdom” – and through its tough competition in a year brimming with escapist, high-tech spectacles.